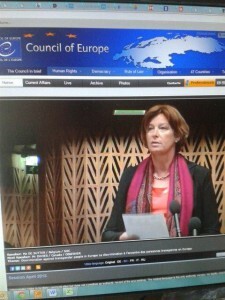 On April 22, 2015, Petra De Sutter delivered a very personal and intense speech in the debate on the Trans Resolution of the Parliamentary Assembly of the Council of Europe. Find below the verbatim transcript. The PRESIDENT – Thank you. I now give the floor to Ms de Sutter. 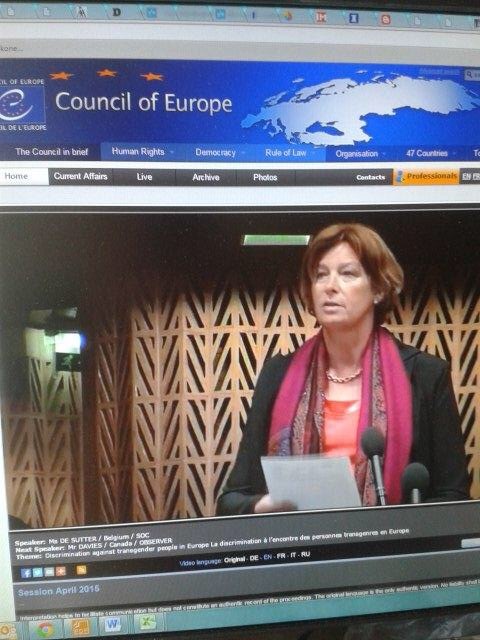 Ms DE SUTTER (Belgium) – As a transgender woman myself and a member of this Assembly, I cannot but speak this afternoon. The draft resolution on discrimination against transgender people in Europe is a unique endeavour in many ways, and I congratulate the rapporteur and her team on their extensive research, their commitment to the subject and the thoughtful recommendations that they have made. Ignorance breeds fear, and fear breeds aversion and hatred. That is the mechanism of all discrimination and violence in the world. The resolution will contribute to a better understanding of the transgender cause, and will therefore fight doubly against discrimination – first, simply by discussing the issue, and secondly by dealing specifically with discrimination against transgender people. It is true that being transgender in 2015 is still a huge cause of discrimination and violence in most countries of the world. I myself experienced a very painful personal journey before I truly understood who I was, and that identity crisis brought me to the verge of death. I survived, but many others did not and do not. I am still grateful for the help and understanding that I received from many people at my university and at the hospital where I work when I came out 10 years ago. However, many others are not so lucky. They lose their jobs, their friends, their partners and sometimes their lives because of ignorance, hatred, discrimination and violence. Around the world, one transgender person is murdered every three days just for being transgender, and often the victim is blamed rather than the murderer. Some 41% of people who are transgender or gender non-conforming have attempted suicide at some time in their life – being transgender is one of the most deadly conditions that one can be born with. Colleagues, please give the resolution the attention it deserves. Being gender non-conforming is not a disease, and it is not a sin. It is a variation on the gender continuum, an example of the rich diversity of humankind, and it is not right if people are discriminated against because of it. I ask you to spread this insight in your parliaments and put it in the highest place on your agendas, because it may save many people’s lives. I ask those of you representing countries where LGBT rights are already protected to follow the example of Malta, where gender identity has been recognised as something that only the individual himself or herself can experience, and grant a legal right of self-determination. Remove from your laws the psychiatric labelling of the condition and the requirement of forced sterilisation, and grant transgender people full human rights, the same as any other citizen in your country. Colleagues, I ask you, for all my peers out there, to take the resolution to heart. In helping to fight discrimination against transgender people, you can, for many of them, truly make the difference between life and death. I thank you. The PRESIDENT – I would like to thank and congratulate you, Ms de Sutter. It is not usual for the President to make a statement after a member of the Assembly has taken the floor, but I do it now. All that I can say is thank you, with all my heart.